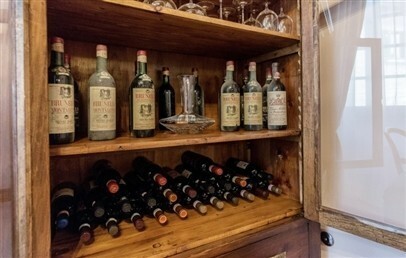 "Il Tosco" Hotel is located in the historic centre of Montepulciano, a place also famous for its wines: the "Nobile DOCG", the "Rosso di Montepulciano DOC" and "Vin Santo DOC". The fascinating cities of Siena and Perugia are only a 50 minute drive away and the art city Florence, as well as the eternal city of Rome can be reached in about 2 hours. The distance to the airport of Florence is approximately 125 km. Being a historic residence of the 16th Century, the Palazzo Smaghi Bellarmini is full of charm and nobility, yet with a cosy atmosphere and noble elegance. 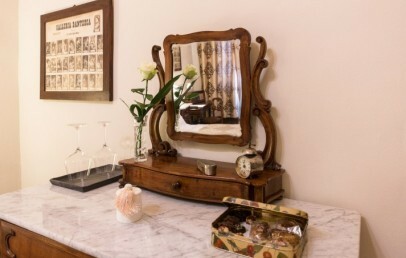 A multifaceted combination of diverse services can be experienced at “Il Tosco” Hotel: attentive and careful hospitality, aristocratic style and the possibility to discover the art and a territory rich of history. Breakfast is served either as a buffet a/o à la carte and in the late afternoon “Il Tosco” offers its guests a glass of “Rosso” wine with local appetizers. In addition, the wine cellar of the “Tosco” is waiting to be visited for tastings of some exquisite local wines. The hotel consists of four elegant superior and deluxe rooms and two luxurious living rooms. These rooms can be combined together to form a spacious suite or have an ample apartment. A good alternative to make your stay very comfortable and also ideal for families. The suite or apartment are available on request only. There are four Deluxe and Superior rooms. 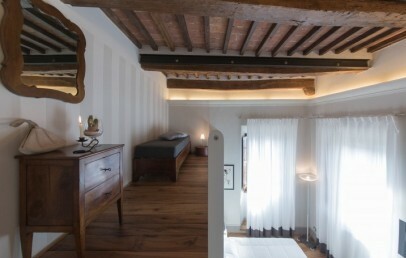 A perfect blend of ancient and modern, equipped with every comfort, elegant simplicity and an idyllic atmosphere. 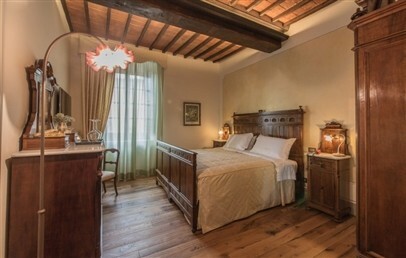 All rooms have air conditioning, minibar, satellite LCD flat screen TV, complimentary internet WI-FI connection, telephone, bluetooth dock station, safe, bathroom with shower or Jacuzzi bathtub, hairdryer and windows with views on the countryside around Montepulciano or on the alleys of the village. 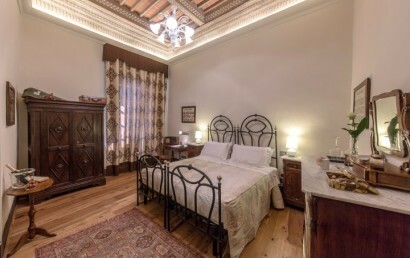 Deluxe "Dante" – the most luxurious and aristocratic accommodation, furnished with antique furniture and a bed from the 16th Century, a wooden oak floor, a high, decorated ceiling and a nice view on the valley of Montepulciano. The large bathroom has a shower and a Jacuzzi tub for two with 40 "TV with Sky. Deluxe "Poliziano" – a very modern double room with a small loft with a single bed. 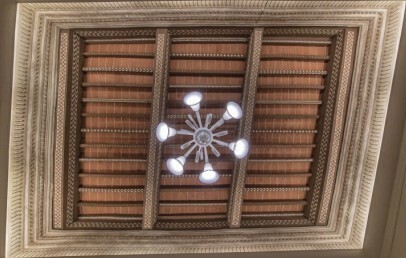 The original architecture is combined with design elements, two windows brighten the room wonderfully and offer a wonderful view of the panorama. This accommodation is ideal for 2 adults with a child over 5. 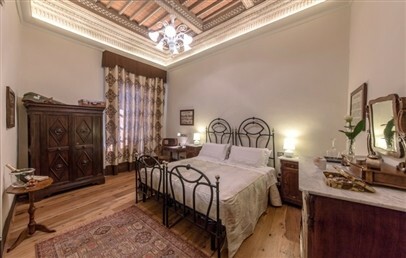 Superior "Verdi" and "Puccini" – equipped with antique furniture of the 19th Century, hand-embroidered fine bed linen in cotton, a marble bathroom with chromatherapy shower and view on the streets of Montepulciano. Various activities can be arranged on request: dinners in the dinning-hall, mini cooking lessons, wine tastings guided by a sommelier in order to discover the “Rosso” wine and the noble wines of Montepulciano, several excursions to explore the area. For those who wish to relax and pamper themselves at a thermal spa, several thermal sights can be found nearby. Tourist tax: 2 Euros per person per night, exempted children under 12 years. 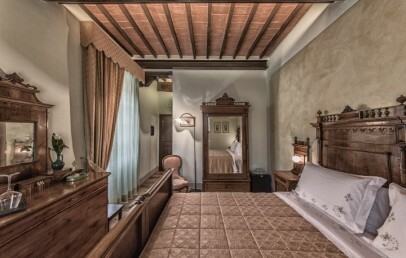 The Deluxe "Dante" double room has a King-Size bed of the 16th century, a warm, ancient oak flooring and a high ceiling with frescos. 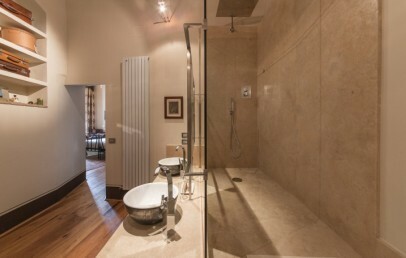 The bathroom is in marble with a large walk in shower, an inviting Jacuzzi for two and a 40" TV with Sky. 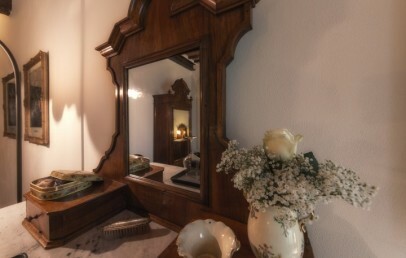 It is the most luxury and aristocratic accommodation of the hotel with a lovely view over the valley of Montepulciano. 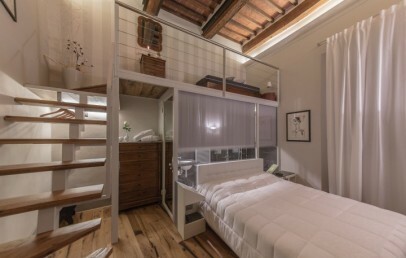 The Deluxe room "Il Poliziano" is a modern accommodation with a small loft, with a single bed (70x200cm) on the upper floor. The bathroom has a shower and necessary comforts. The two windows brighten the room and offer a wonderful view on the Tuscan countryside, the "Amiata" hill on one side and the valley of "Chiana" until the lakes of "Trasimeno" and "Gran Sasso" on the other side. 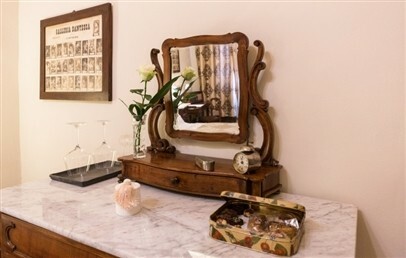 The Superior rooms "Verdi" or "Puccini" have antique furniture of the 19th century. They offer a comfortable King-Size double bed, a wooden floor and a bathroom with chromatherapy shower. 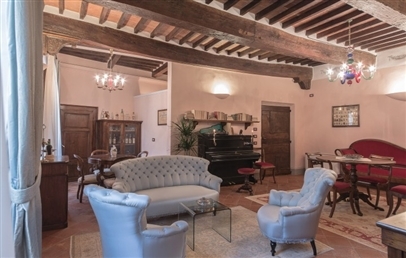 The ambience is cozy and rich of Tuscan tradition and the view from the window is on the historical part of the medieval town of Montepulciano. 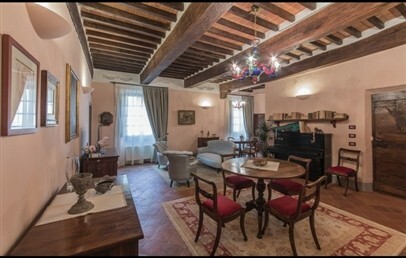 Suite composed by two double bedrooms (Verdi and Puccini rooms) and a 45 sqm living room. The Suite features air conditioning, minibar, TV LCD, free Wi-Fi, dockstation Bluetooth. Private bathroom with chromo therapy shower. The price includes: daily change of bed linen, welcome drink, welcome gift, a free service of cafeteria 24h. View of the old town. You can reserve the whole hotel for exclusive use: the apartment is composed by 4 bedrooms and 2 living rooms. The kitchen can be used for the cafeteria and the microwave. Customers can ask for a private chef for lunch and dinner. 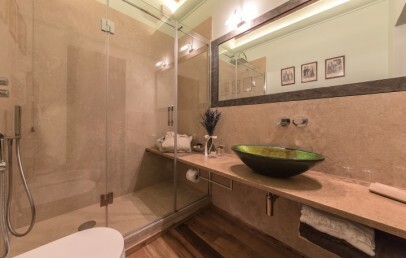 The bathrooms feature a 2 person Jacuzzi, 2 showers and 2 cromo therapy shower. The price includes: daily change of bed linen, welcome drink, welcome gift, a free service of cafeteria 24h, free Wi-Fi. View over the vally and the old town. 10% reduction on your stay. The booking is a non-refundable one and the total amount of the stay is to be paid upon confirmation.